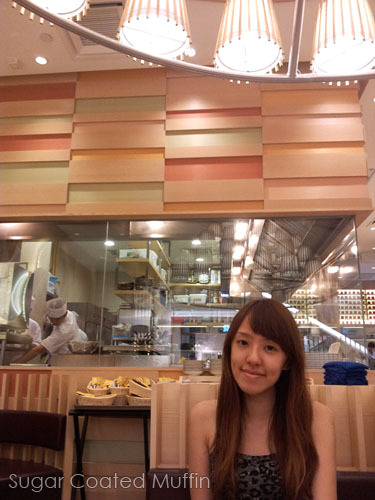 Two hungry sisters were in Paradigm Mall, hungry and could eat a cow. Somehow still managed to walk all over the mall deciding what to eat before settling on our first location (wth went one huge round) which is Pasta Zanmai. Perhaps it's because it wasn't peak hour.. The shop was pretty empty and we had the attention of all the staff there. Pretty interior, I must say.. Found it strange that our seats didn't have a head rest/back wall though. If both you and the person sitting behind you lean back your heads, you'll have a really awkward moment! Days of insufficient sleep = 2 zombies. Got myself a Mini Seafood Kimuchi Pasta and Salmon Sashimi, RM 25. If you like kimchijigae, you will probably like this too! Kimuchi is the Japanese version of kimchi although I honestly thought they're quite similar. 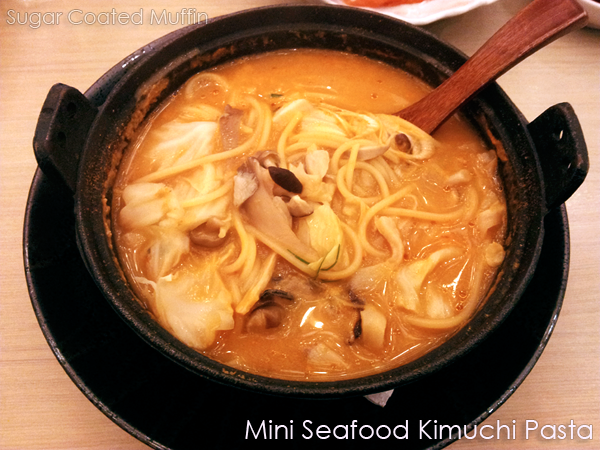 The noodles are like spaghetti and the kimuchi soup is really yummy (salty, sour and spicy). I found 1 scallop, 3 mussels and 1 clam. There are also vegetables and mushrooms inside. Could have contained prawns and squid too. Can't really recall but the menu shows that there should be. Being particular about sashimi, I found theirs to be satisfactory. They're really fresh but the slices are thinner than some other places. Dipping into the soy sauce and wasabi really amps up the taste. Not sure why theirs is so fragrant! My sister's Mini Toriniku Cream Pasta Soft Shell Crab Tortilla, also RM 25. 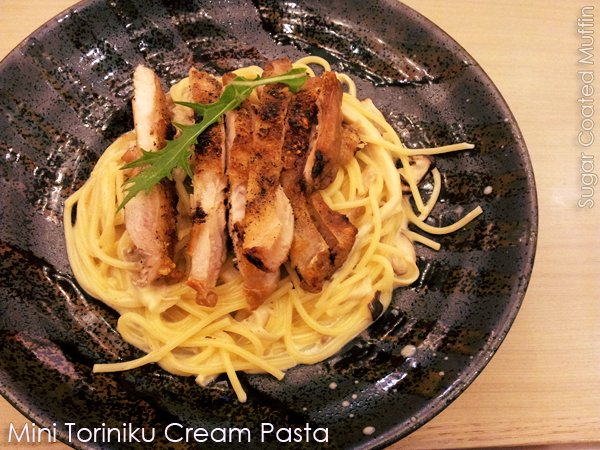 The Toriniku Cream Pasta/Chicken Cream Sauce Pasta highly resembles carbonara in terms of outlook and taste. There are mushrooms in the cream sauce. On top are some pieces of chicken that honestly tasted like the Chinese 'siu yuk' because it's salty with a slightly bitter crunchy skin. I like how they placed the vegetables standing up like that. The Soft Shell Crab Tortilla Roll is tortilla wrapped around vegetable and soft shell crab then topped with sauce and fish roe. The roe was big and juicy; I could hear them pop as I bit into them. The tortilla is soft but as you bite inside, you reach the fresh green leaves and the crunchy crab. The crab was not oily. Quite a special and tasty dish.